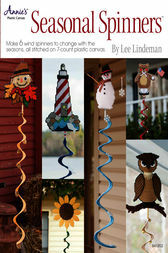 Whimsical whirlers are easily constructed following the six seasonal patterns in this manual for working with 7-count plastic canvas. The spinners move in a breeze and are a charming—and quieter—alternative to wind chimes. These intermediate-level projects include a sunflower, a flag-waving teddy bear, a lighthouse, a scarecrow, an owl, and a snowman, covering all of the seasons and incorporating a variety of embellishments. Lee Lindeman is a former art teacher and a freelance designer and crafter whose creations have been featured in kits and books. She is the author of Circus Puppets. She lives in Asheville, North Carolina.